The future of the greyhound industry is under threat from the boycott of racing at Shelbourne Park, Bord na gCon has warned. It claimed the shutdown of meetings at the Dublin stadium over the past three months, which was sparked by the decision to close the Harold’s Cross track in February, has resulted in a loss of €300,000. Bord na gCon – otherwise known as the Irish Greyhound Board (IGB) – defended its decision yesterday to sell the Harold’s Cross track, claiming it made no commercial sense to operate two greyhound stadiums in Dublin which were just two miles apart. Phil Meaney, the chairman of IGB, told the Dáil public accounts committee (PAC) that clearing its large debt of over €20 million was not the sole reason why the facility was being sold. It was revealed earlier this week that the land is being sold to the Department of Education to provide new schools in the area. The sum involved is understood to be about €15 million. 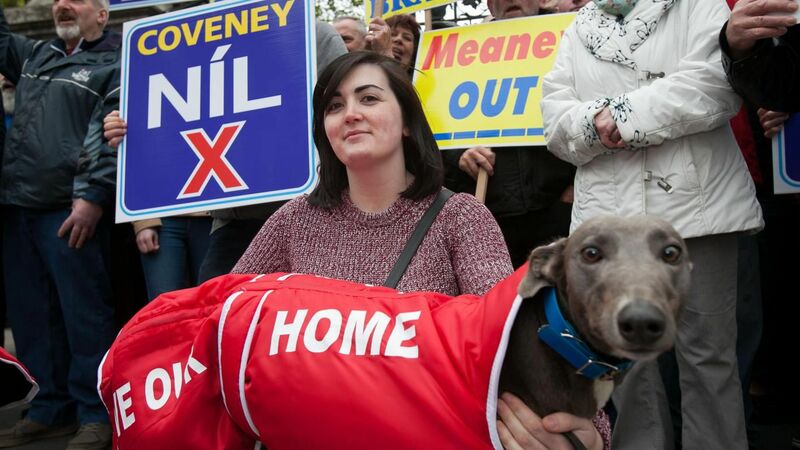 No racing has taken place at Shelbourne Park since February as a result of regular pickets organised by the Dublin Greyhound Owners and Breeders Association which also staged a protest outside the Dáil yesterday. The IGB chairman said he had made efforts to unite a “splintered” industry but admitted it had proved “an impossible task”. The boycott is creating fresh problems as IGB has lost €300,000 over the stand-off while it has cost owners and trainers €250,000 in prize money. The effective closure of Shelbourne Park was not sustainable, Mr Meaney said. “IGB cannot haemorrhage money in this way and unless there is a resolution, and I have to make this clear, then the end game is the cessation of all racing nationally,” he told TDs. Mr Meaney said that the board had agonised “long and hard” over the decision to sell Harold’s Cross which he described as “an iconic stadium”. He reminded the committee that the sale was a key recommendation in a review of the IGB undertaken by Indecon International Consultants in 2014 after it ran up large debts after spending €21 million on a new stadium in Limerick – expenditure criticised by the comptroller and auditor-general. Mr Meaney was supported by Pat Creed, an IGB director and banker, who said he know of no business where two premises – a reference to Dublin’s two greyhound tracks – were closed for four to five nights per week. “If this was a commercial operation, they would be merged,” Mr Creed said. The PAC also heard that a 16-acre site bought at Meelick on the outskirts of Limerick city in 2005 as the site of a new greyhound track for €1.5 million was now worth just €100,000. The plan never went ahead owing to a lack of access to the local road network, while the land is also prone to flooding from the River Shannon. David Cullinane, a Sinn Féin TD, said the organisation was characterised by “mismanagement, poor decision making, bad judgment and incompetence”. The payment of salaries totalling €1.2 million to ten IGB staff was criticised by Peter Burke, a Fine Gael TD, who said such levels were “unsustainable”. At the start of a four-hour meeting, Mr Meaney said that IGB’s difficulties were not unique as the greyhound industry globally was facing many challenges mostly due to the move from track to online betting which had implications for attendances at race meetings. He told the committee that after the recent closure of Wimbledon Stadium, London no longer had a greyhound track where once it had 33 tracks, while there were only ten full-time tracks in the US. “The notion that Ireland would somehow be unaffected by the reasons which have contributed to this worldwide decline is a nonsense,” Mr Meaney said. Ireland still had the highest number of greyhound stadiums in the world on a per capita basis which he claimed was a reflection of the strength of the industry. In total there are 16 tracks operating in the Republic. Mr Meaney told the committee that the board of the IGB had to work through “a crippling, systemic overhang of debt” which stood at €20.3 million at the end of last year. The board was seeking to implement all the recommendations of the Indecon report to ensure the industry had a viable future, even if some decisions were unpopular, he said. It was important to understand that the scale of the debt had grievously inhibited the board’s capacity to invest in the industry, Mr Meaney added.